Kissan Henry of Glasgow Housing Scheme, New Amsterdam with Assistant Police Commissioner, Paul Williams. 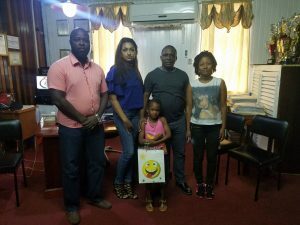 The seven-year old girl, who rescued her four year old brother from their burning house by letting him down with a bed sheet, was Saturday morning honoured by the Guyana Police Force. “We have recognized her bravery, and brilliant thinking from a humanitarian standpoint at such a tender age,” the police force said. Demerara Waves Online News also understands that she visited the headquarters of the Guyana Fire Service where she mingled with, among others, female fire fighters. Kissan Henry of Glasgow Housing Scheme, New Amsterdam, earlier this week (Monday, January 6, 2018, saved herself and brother from the fire of their two-story building while her mother was at a drug block. Their mother, Kimilia Henry, has since been charged with neglect and placed on GY$500,000 bail. The Guyana Police Force presented her with a plaque, books and a bottle of perfume on behalf of the Commissioner of Police, Seelall Persaud, Crime Chief- Assistant Commissioner, Paul Williams and other members of the Force. “The Crime Chief Paul Williams arrived at the initiatives and partnered with the Mark Benschcop Foundation who will be honoring Ms Henry today with other key stakeholders,” the force said.